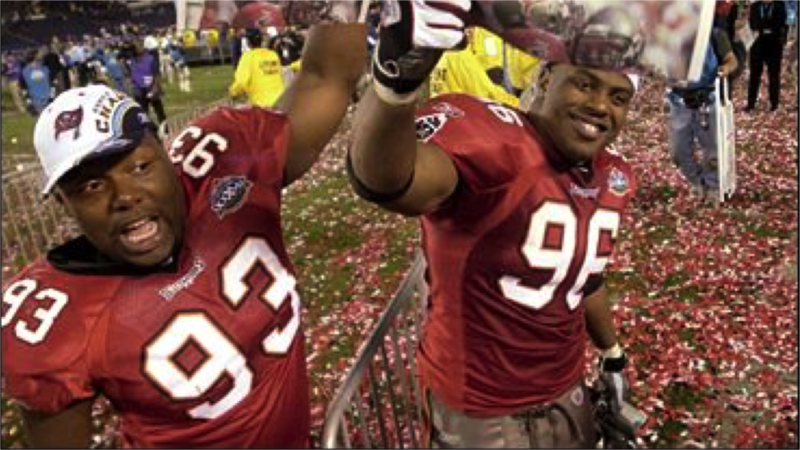 DeVone Claybrooks (left) celebrates with teammate Ellis Wyms after Tampa Bay won Super Bowl XXXVII over Oakland. DeVone Claybrooks is Super Bowl bound. The final few days of laying low before head coaching duties heat up next week not only involve the big game, but also a little snowboarding and cooking. 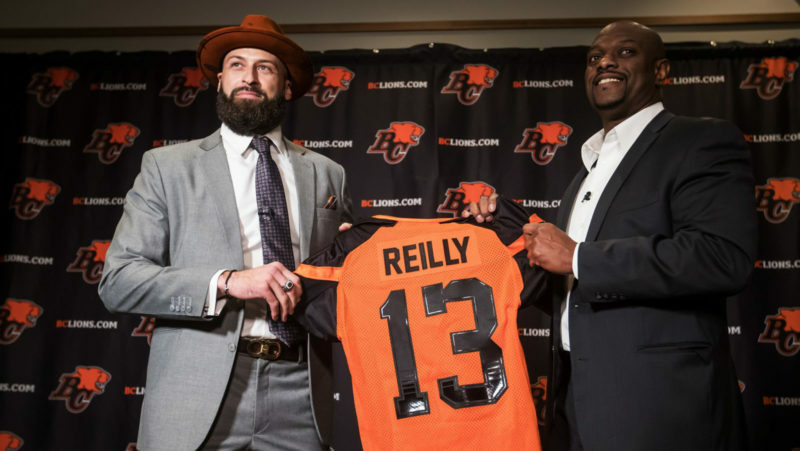 On Friday he heads to Atlanta for the football festivities where his friend and former Calgary Stampeders teammate Deron Mayo is in his first season as the New England Patriots assistant strength and conditioning coach. 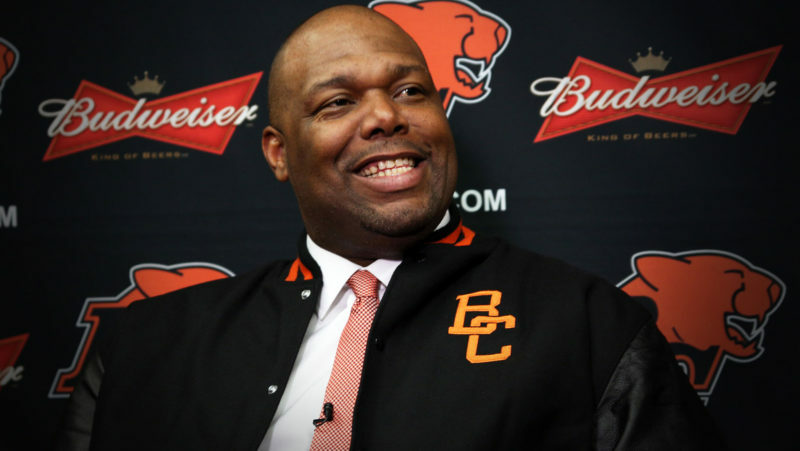 And although 16 years have passed since Claybrooks and the Tampa Bay Buccaneers won Super Bowl XXXVII over the Oakland Raiders, the new Lions sideline boss is reminded every Super Bowl week just how special that was. “It felt surreal,” Claybrooks said of earning his first professional championship ring. In between NFL stops in Green Bay, Cleveland, Arizona, San Francisco, Dallas and a cameo appearance with the Rhein Fire of now-defunct NFL Europe, Claybrooks found himself on the Tampa Bay roster for that championship season of 2002, dressing in seven regular season games and all three in the playoffs. 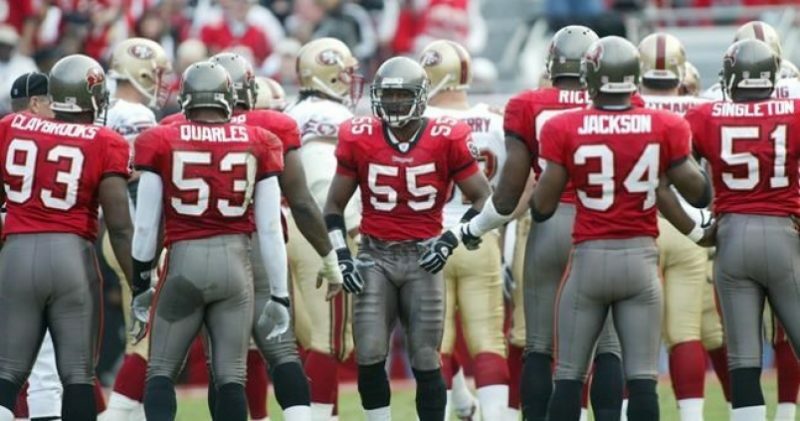 Those Buccaneers won’t go down as the greatest team of all-time. Far from it. But you could scan the list of each of the 52 NFL teams that have raised that Lombardi Trophy and likely be hard-pressed to find a group with a bigger cast of characters than the Bucs squad that reached the top of the NFL mountain. “Characters would be an understatement,” the Lions head coach chuckled. Claybrooks will be the first to tell you it wasn’t all fun and games. Being a young player in that defence featuring some of the best players of that decade no doubt went a long way in his development as a player. It was an era where boasting a dominant defence was the big model for building a Super Bowl-calibre squad. ‘The reason we were elite as a group is because they put in the time before and after practice,” Claybrooks recalled. The arrival of head coach Jon Gruden from Oakland also proved to be a major coup for the franchise. An offensive guy at heart, the charismatic Gruden received an early proclamation from his big boys on the other side of the ball. “The craziest part is when Gruden first got there, the defensive leaders said to him ‘if we can get 21 points out of you (the offence), we can win the Super Bowl,” Claybrooks said. Before the 48-21 dismantling of the Raiders on Super Bowl Sunday in San Diego, the Bucs took down San Francisco 31-6 before travelling to the well-known hostile territory of Philadelphia and taking down the top-seeded Eagles 27-10 to do something the franchise had never done: advance to the Super Bowl. That game was best remembered for being the final one at old Veterans Stadium- a venue that famously had a prison down below to hold unruly fans. “We were chanting on the field ‘we’re blowing up the vet! We’re blowing up the vet!” It was crazy,” the head coach remembered. The jubilation eventually subsided when the Bucs players, coaches and staff were stuck on the tarmac at Philadelphia Airport for three hours waiting to fly home. The belief was the airport union workers made sure the plane couldn’t take off in retaliation for their beloved Eagles losing. Perhaps it served as even more motivation for Claybrooks and company to finish the job next week. The Bucs’ defence proved to be too much for San Francisco and Philadelphia before they forced five turnovers in the Super Bowl win over Oakland. That season would be the only team Claybrooks experienced championship glory as a professional player, but it likely made him appreciate both of the Grey Cups he won with the Stampeders: in 2014 as defensive line coach and last season as defensive coordinator- his final Calgary voyage before officially landing as Lions head coach on December 11th of last year. Now the goal is to win one as a head coach. “It would put a nice exclamation point on your career as a coach and put yourself in some elite company. 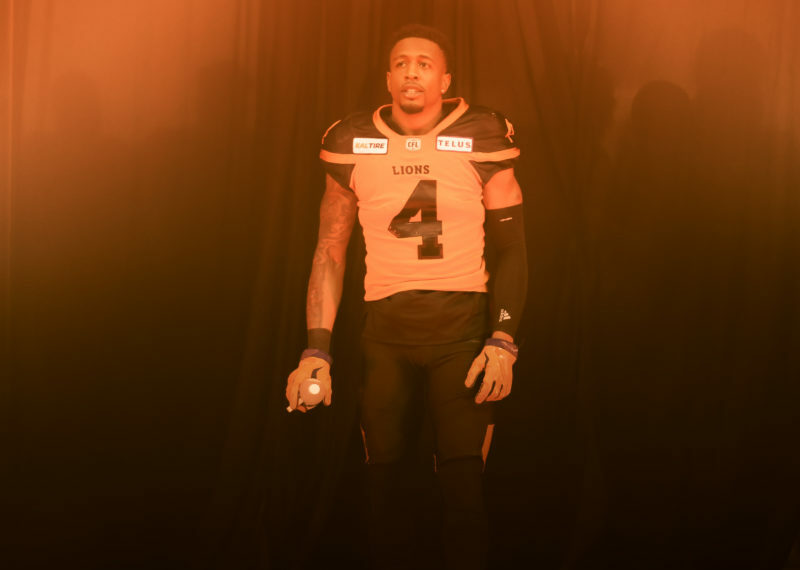 If that’s not your goal then you’re not in the right business,” the head coach said. As for this year’s game, when pressed for a prediction Claybrooks leaned towards the Los Angeles Rams but left it with these words of caution. No matter the outcome, you can bet he will be smiling at the memories of Tampa Bay.